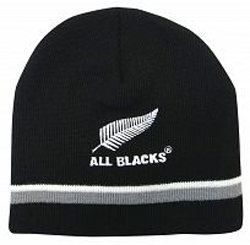 Known for blacking out packed rugby grounds across New Zealand, this beanie is requisite for any All Blacks fan on tour. It is knitted from black acrylic for strength and insulation, and bears a sharply-stitched silver fern dead in the centre. A grey and white band runs between the emblem and the lower edge.